- 10 % discount until 20 November 2018. - 7=6 all reservations during the period 15 March - 30 March 2019! 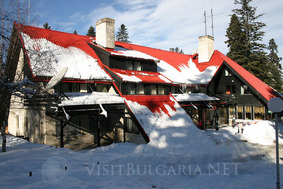 Location: The hotel is situated in the centre of Borovets, not far from the main lift stations and resort infrastructure. Room facilities: The rooms have cable/sat TV, phone, mini-bar, private bathroom and WC, balcony. The hotel facilities include a parking lot, safe deposit boxes on the reception desk, currency exchange office, laundry and dry cleaning, shop, conference room with 35 seats, restaurant with 90 seats, lobby bar, ski rental and ski school, medical centre.